As summer 2017 approaches, Hawkers Beer has entered the ever busier world of cans. And, in christening its canning line, the Reservoir brewery has also entered the ever busier world of XPAs; for a style that was the focus of much debate as to what it actually meant/was/should be not too long ago (maybe still is now), it's sure proving rather popular. 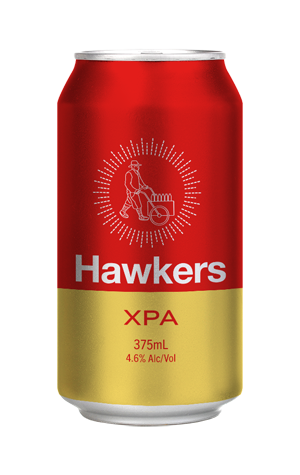 This XPA will be the first of a number of Hawkers beers to appear in cans, with a West Coast IPA to follow. As for what the X, P and A stand for in this case, it's certainly not extra booze compared to the brewery's Pale Ale, as it's more than half a percent in ABV lighter, but it certainly packs an extra punch – a tropical fruit punch, you might say – when it comes to the hop character, with some fruity confectionary aromas and flavours and a resinous bite too. The cans have sparked some lively discussion. They retain the clean lines of the pre-existing Hawkers packaged lines but, in place of black with flashes of colour, here it's extrovert colour all the way: sunshine yellow and fiery red. We've heard people say it reminds them of everything from McDonald's to raspberry and pineapple Calippos; either way, it's likely to stand out in a fridge and the team behind it will be confident anyone lured in to try one, like a moth to a light, will be back for more.